I often suspect that the LPG cylinder supplied by the distributor is underweight, but I have no way of confirming it because I do not have a weighing scale at home to check the weight of the cylinder. The distributor dismisses my complaints about the gas not lasting as long as it usually does, saying that the consumption must have gone up. How do I deal with this? In order to deal with complaints such as these and facilitate the weighing of the LPG cylinder at the time of delivery, the Legal Metrology (Packaged Commodities) Rules was amended last year to make it compulsory for every LPG delivery man to carry a weighing instrument. "(8) (1) All the marketing companies, manufacturers, packers, importers or distributors of Liquefied Petroleum Gas cylinder shall maintain a check weigher or non-automatic weighing instrument, digital or analogue, of Accuracy class-III (Max. 50kg, e=10g) to check the weight of the Liquefied Petroleum Gas cylinder. (2) The marketing companies, manufacturers, packers, importers or distributors referred to in sub-rule (1), shall provide to the delivery man to measure or weigh the correct quantity of the Liquefied Petroleum Gas cylinder.” So insist on the delivery man weighing your LPG cylinder at the time of delivery. That way, you will make sure that the cylinder is not underweight. If the delivery man says that he does not have the weighing scale, complain to the department of legal metrology, which is the enforcing authority. 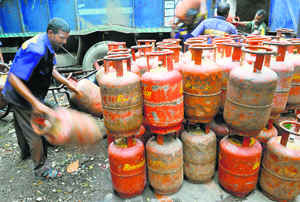 Recently, I found the LPG cylinder supplied to me, containing only 12 kg as against the 14.2 kgs promised on the cylinder. When I complained, the distributor argued that it was just not possible and said my weighing scale must be defective. I have used that cylinder now, but the next time this happens, I want to make a formal complaint. How do I do it? As I said earlier, the delivery man himself has to bring the weighing scale and weigh the cylinder. You can weigh it on your scale too, but please do it in the presence of the delivery man and if you find the weight to be less than 14.2 kg, note it on a sheet of paper, write the date and time and get the delivery man to sign it. You should sign it too and if necessary, you can even call one of your neighbours and ask that person to confirm the weight of the cylinder. Once you have this evidence in hand, your complaint will have more weight and neither the distributor nor the oil company can brush aside your complaint. In fact in such cases, you should complain to the gas company and demand that they verify whether the shortfall happened at the filling plant or later. If it has happened at the filling stage, they will have to withdraw all the cylinders from that particular batch. If not, they will have to investigate as to where the pilferage has occurred. They must let you know the details of their investigation and the steps taken by them to prevent recurrence. They must also tell you about the action taken by them against the persons responsible for delivering the underweight cylinder. You should also complain to the Department of Legal Metrology, which is responsible for ensuring that only correct quantity is sold to the consumer. The evidence collected by you will be of immense value and help you in pursuing the case.